Several Blue Oaks (Quercus douglasii) at the 2,200′ elevation were covered with these galls, ranging in color from rosy red to orange. There are over a dozen different kinds of oak galls, but I’d never seen these before. After a cursory search of the Internet, I’ve identified them as Wool Sower Galls. We have been concerned about the current drought’s impact on the Live and Blue Oaks on the ranch, killing a conservative 10-15%, though we have stands of 10-20 acres that are only leafless skeletons. Exerts from Glenn Keator’s “The Life of an Oak”, (1998 Heyday Books) is fascinating reading: Whether galls harm oaks is uncertain; their prominence on weak trees suggests that possibility, although most studies don’t implicate galls in the death of oaks. This notwithstanding, heavy infestations may further weaken trees that are already stressed. One highly specialized group of insects–the cynipid wasps (family Cynipidae)–is responsible for the majority of oak galls. White oaks host the greatest numbers of gall species. And among the white oaks, Quercus douglasii, the California foothill species called blue oak, harbors the most lavish diversity of them all. Life for a cynipid begins as an egg laid in the young, active meristematic tissues of twigs, buds, leaves, or flowers. Meristems, where cells actively divide to add new growth. Because the newly formed cells have not yet taken on any specialized mature form–they do that later–they are able to accept new “programming.” This is what the cynipid hosts provide. Some researchers have even gone so far as to suggest that there be actual bits of DNA from viruses in the larvae’s saliva. Viral DNA can replace the genetic machinery of host cells, completely reprogramming them and their activities, though how and why these viruses would have entered into such a specific relationship with the larvae is not clear. 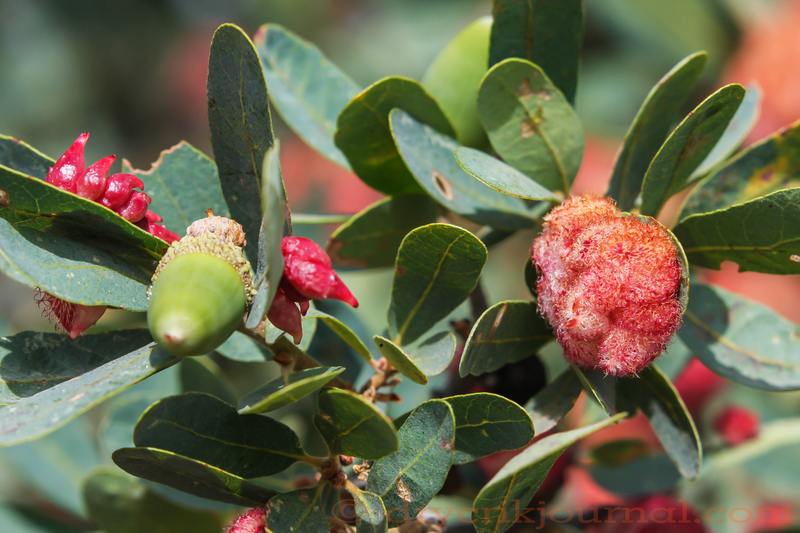 My photos below suggest the Wool Sower Gall evolves from a small red growth that explodes into a hard, wooly-looking gall. It should be noted that these blue oaks are relatively healthy, especially compared to the many around them already losing leaves. It should also be noted that we haven’t seen many acorns for the past three years with the exception of these trees this year. I’ll try to keep track of these oaks and galls going forward, but any more info would be appreciated. 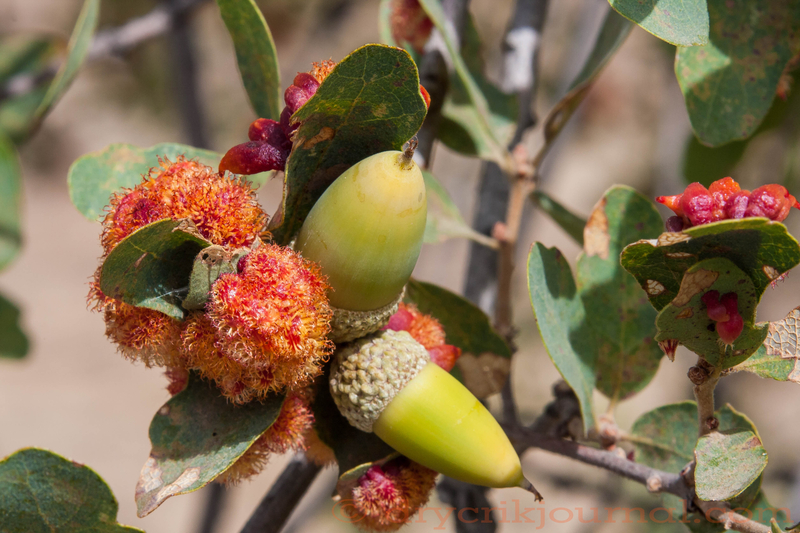 This entry was posted in Photographs, Ranch Journal and tagged "The Life of an Oak", Blue Oaks, Glenn Keator, Heyday Books, oak galls, weekly-photo-challenge, wool sower gall. Bookmark the permalink. Interesting information on the oak galls, John. I collect the dried galls to make dyes for my blankets and get beautiful tans, rich browns and very deep chocolate browns. Who knew there were so many varieties. Thanks. With these new galls (to us), Robbin and I discussed your dying process. Next project, if time allows, is to photograph all the different kinds of oak galls we have around here. There are several red varieties I would think, (but what the hell do I know), would make good dyes. So many oaks are in leafless disrepair, if not dead already, that all the galls may be hard to find this year. New photographic amazements and delights daily! What a nutritious blog! (Not to mention the poetry.) Very sad to hear of the high percentage of tree loss. Hope a good El Nino is coming to get many acorns and baby trees off to a good start this fall. Thanks so much for letting us share in the life of Dry Creek. You’re welcome. We’re just bumping along sharing what we see. Glad you enjoy it. What an interesting looking gall! It also might be the Crystalline Wall Wasp (Andricus crystallinus) which is found on the underside of blue oak leaves. 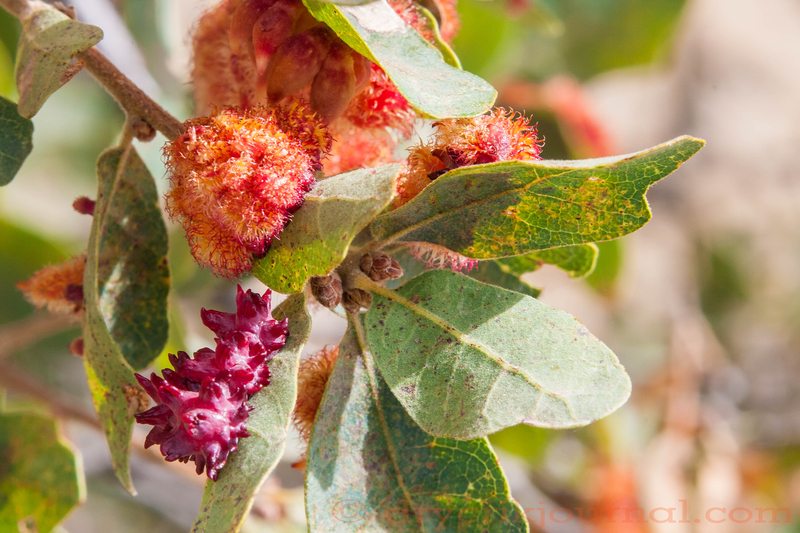 A great source for info on local galls is Ron Russo’s “Field Guide to Plant Galls of California and Other Western States” published by UC Press. 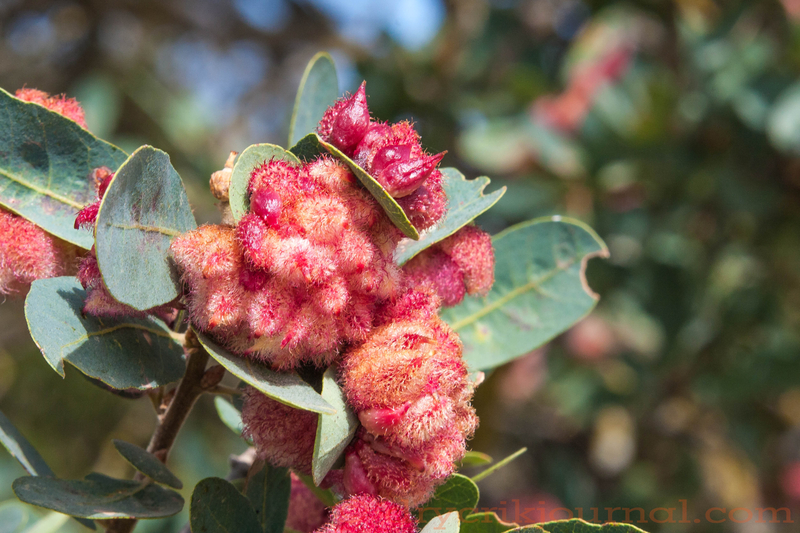 I have not seen this gall but have found up to 20 other species at the Homer Ranch Preserve. Thank you very much, John. I was hoping someone might add references to this conversation. I’ll order Russo’s guide to have on hand. Beautiful photos, and I love that book. Keep us posted….